Multinational beer company AB-Inbev may have its critics. But one thing it’s difficult to be critical of is its “Global Smart Drinking Goals“, an initiative that aims to reduce alcohol harm across the world. One of these goals is to devote 20% of its production to low and no alcohol beers by 2025. That ambition might seem hefty when you consider this figure was just 6.7% at the end of 2017. Yet, AB-Inbev has already achieved this 20% goal in six countries including Australia. Its definition of low alcohol being anything under 3.5% ABV also helps matters. To be fair though, the company’s zero alcohol range is already extensive with beers like Beck’s “Blue”, Budweiser “Prohibition”, Castle “Free”, Lowenbrau “Alkoholfrei” and Franziskaner “Alcoholfrei” already popular. Another of AB-Inbev’s brands is Belgium’s Jupiler, the country’s biggest selling beer. Jupiler’s best known for its flagship 5.2% pale lager. “0.0%” is an alcohol-free version of that beer. It’s the brand’s third foray into alcohol-free beers after “N.A.” (2004 to 2017), and “Force” (2011 to 2014). 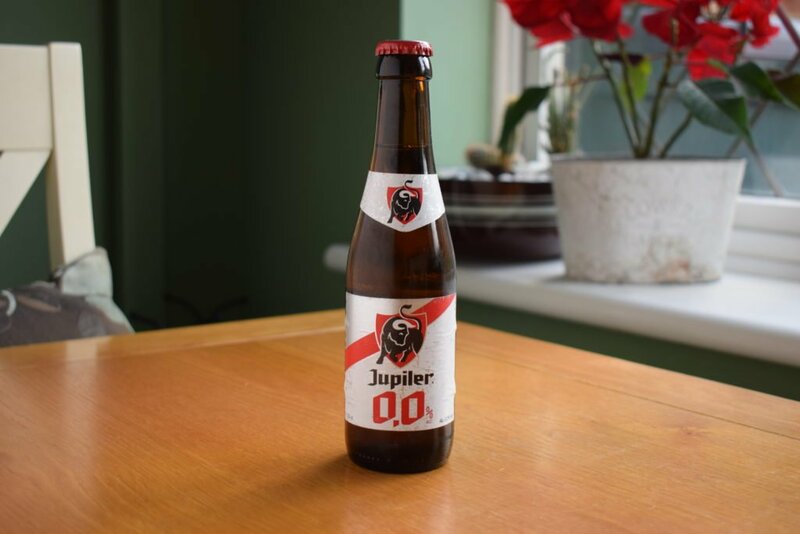 Like the full-strength Jupiler, 0.0% is made from water, barley malt, maize and hops. There’s also added sugar and our old friend, those “natural flavourings”. It’s fermented as per the standard brewing process with the alcohol removed before packaging. Despite the added sugar, it’s low in sugar overall. It pours a luminous amber with a whisper of carbonation that leaves only a few bubbles clinging to the side of the glass. The familiar clean aroma of pale lager malt hits your nostrils first. Then a little root beer. Then a little lemon. Then a little floral hoppiness. It smells alcoholic and is pretty varied for a pilsner. As the beer warmed up, I encountered some sourness in the aroma. But it wasn’t unpleasant. 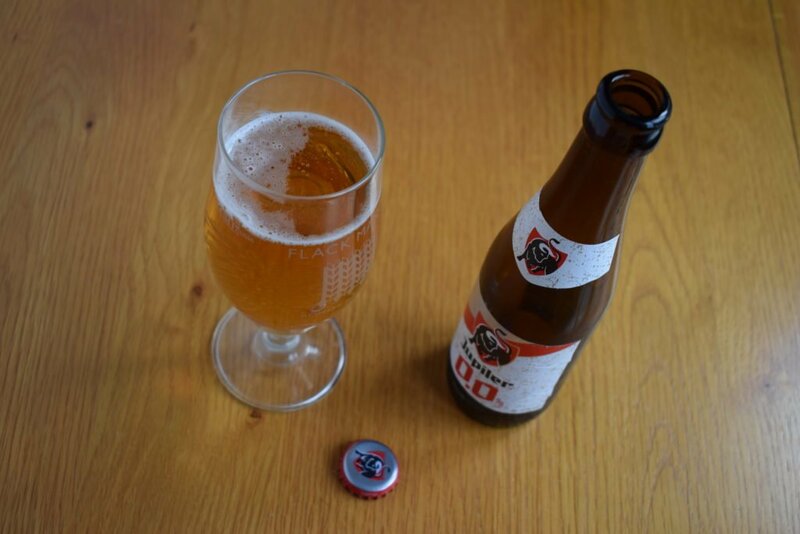 0.0% has a light to medium body, mimicking a standard Belgian or German pilsner. There’s a lack of fizziness but it’s far from flat and is pleasant to sip. The flavour is clean and malty. There’s hardly any bitterness, and I found myself craving more bitterness after each sip even though it comes through a little as you get used to the taste. There’s a big hit of sweetness at the end of each sip, which a bit more bitterness would take the edge off. 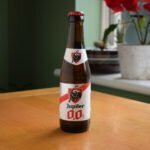 In a market full of undrinkable and unmemorable pale lagers and pilsners, Jupiler’s 0.0% offers a bit of quirk in the taste and aroma department. The flavours aren’t as varied and interesting as Fitbeer or Lucky Saint. But it’s a pretty good effort from a big beer co brand.